My Mom wanted to do something slightly different for the holidays this year. Instead of a huge hunk of meat like a roast or ham or something for Christmas Eve dinner, she wanted to do a bunch of smaller plates in courses. I’m almost positive that my loving mother chose this style of meal because it forces people to sit around the table and actually talk for a longer period of time. Luckily, I like talking and eating and cooking, so I was happy to help her plan the feast. We settled on Italian food because it’s pretty normal for that to be served in courses. Most of the courses were very straightforward and pretty simple to make, but I was particularly proud of the pasta course. I made some delicious homemade Winter Squash Ravioli that turned out better than I was expecting. I’m far from a ravioli expert and only a quarter Italian, but after making these I feel at least a third Italian. Perfectly roasted winter squash pureed and used to fill fresh homemade ravioli makes a delicious and traditional Italian meal. 1) Mix salt and flour and make a well on a clean counter. 2) Whisk together eggs and yolks and add them to the well. 3) Use a fork to slowly incorporate the flour with the eggs. The goal is to add just enough flour to pull the dough together. Ideally, you’ll end up with a ball of dough in the middle of a well of flour as you won’t need all the flour to finish the dough. 4) Knead the dough gently for a few minutes, adding more flour if it’s sticky or loose. Then let the dough rest for 10 minutes. 5) Continue kneading the dough for a another 5 minutes or so, incorporating more flour as needed. 6) Wrap the dough tightly in plastic and let it rest for an hour. 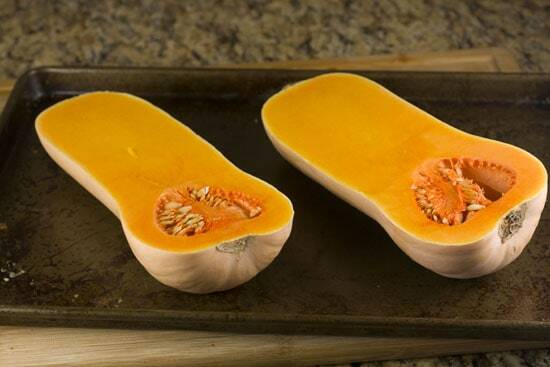 1) Roast squash in a 350 degree oven for about an hour until they are fork tender. 2) In a large pan, add olive oil and cook diced shallots over medium heat. When shallots are soft, add in squash flesh. It should be very soft. 3) Cook the filling for a few minutes, mashing the squash together with the shallots. 4) Add cream, cheese, and nutmeg. Season with salt and pepper. 5) Let filling cool before filling ravioli. 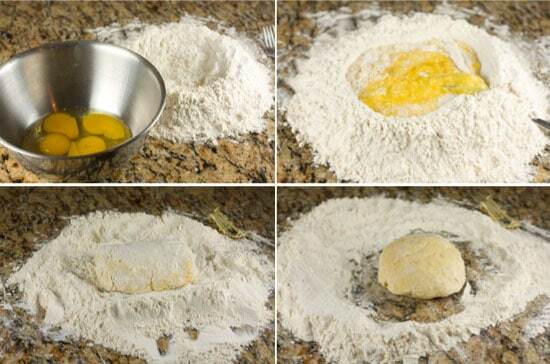 1) Cut pasta dough into quarters and work with one quarter at a time. Pass dough through pasta maker a few times on widest setting, making sure to flour it well. 2) Crank down pasta roller and keep passing through dough until it’s on the second to thinnest setting (normally 7). 3) If you have a long counter, spread the pasta sheet out and flour it heavily on the bottom so it doesn’t stick to the counter. I cut my sheet in half to make it easier to work with. 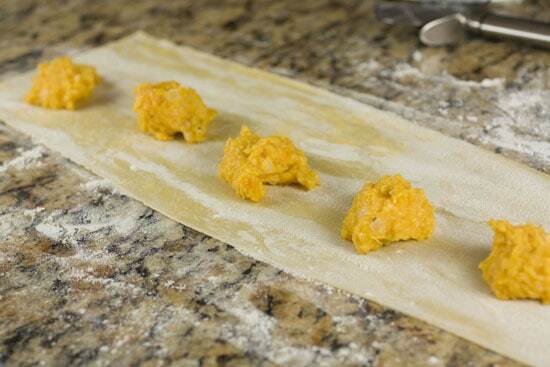 4) Add a large teaspoon of squash filling spaced about an inch a part on the lower 1/3 of the pasta sheet. You should get 12-14 for a full sheet of pasta. 5) Use a roller cutter to cut up the ravioli into individual pieces. 6) Working with one ravioli at a time, dip your finger in water and run it around the edges of the ravioli filling. Then fold the dough over and press out all the air. Press down to seal the edges. Repeat with all the raviolis. 7) Use a decorative ravioli cutter to cut around the edges of each ravioli. This will help seal them completely and also make them pretty. 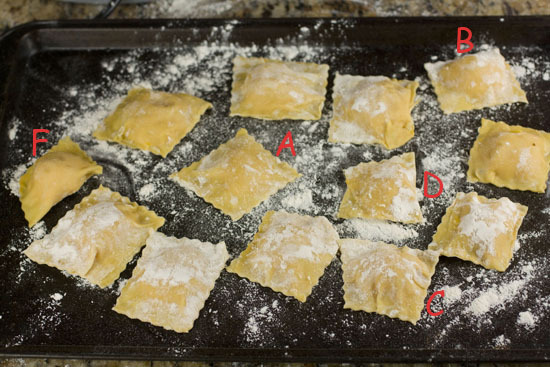 8) Toss ravioli on a baking sheet with some flour. Repeat with all the pasta dough. 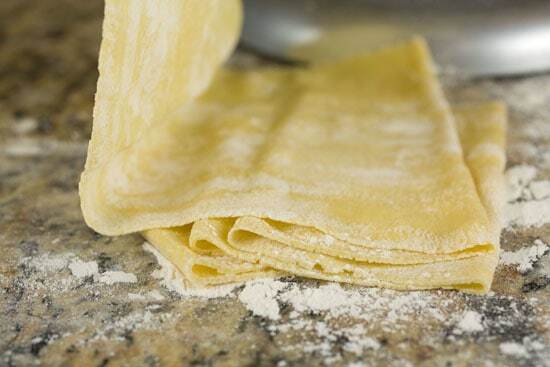 9) Before cooking ravioli, freeze them for a few minutes so they firm up. 10) Cook ravioli in salted, boiling water for about 3-4 minutes. When they all float, they are done. 1) When you put your ravioli in to cook, start sauce. 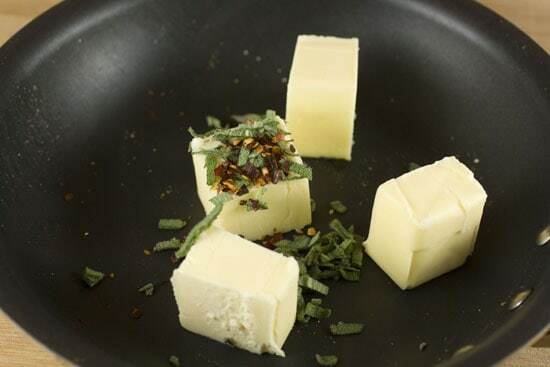 Add butter and herbs to a small saucepan. Melt over medium heat. 2) When butter is just starting to brown slightly, add a few spoonfuls of pasta water which will thicken the sauce a bit. Swirl it around to mix the water and butter. 3) Drain raviolis and add to plate. 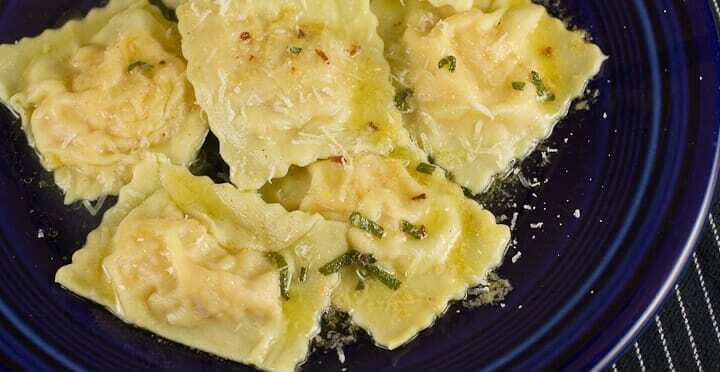 4) Drizzle butter sauce over ravioli and serve with extra cheese. I kept this filling pretty simple and while I used butternut squash for it, I think you could use almost any winter squash. You want about 4 cups of roasted squash so that might mean you need to roast more than one squash if you’re using a smaller one. One large butternut squash is plenty though. Roast this bad boy for about an hour at 350 degrees until it’s very tender. In a medium pot, add the olive oil and shallots and cook for a minute or two over medium heat. 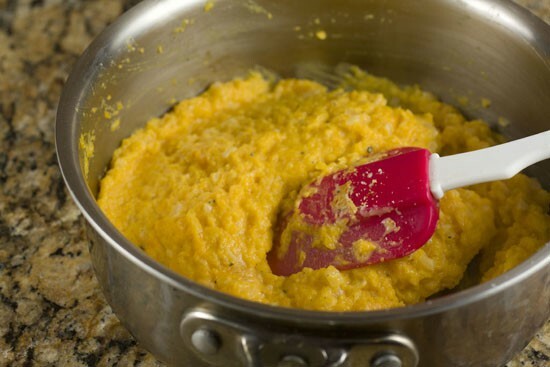 Then add in the roasted squash flesh and mash everything together. It’s okay if there are some lumps. Stir in the cream, cheese, nutmeg, and salt and pepper and your filling is done! Be sure to let this cool completely before filling your ravioli. A bit chunky is fine. My pasta making has come a long way. If you go way back to my first attempt at making pasta, you’ll notice that I had no freakin’ idea what I was doing. I still only have a vague idea as to what I’m doing, but it seems to work for me these days so I’m just letting it happen. Basically, I just mix together my flour and salt and then make a big well on the counter. Then I pour in my eggs which I’ve lightly beaten (upper right). Next, I use a fork to just slowly incorporate flour into the egg mixture. After a few minutes of this, the eggs will form a loose dough. Then you can start gently kneading it (bottom left). As you knead it, the dough will get sticky and you’ll want to work in more flour which is convenient because you will be kneading the dough in a big pile of flour. After maybe 8 minutes of kneading, you’ll have a nice firm ball of dough and probably plenty of flour left over, which is fine (bottom right). Once your dough is made, wrap it tightly in plastic wrap and let it rest for about an hour (conveniently the time it takes to make the filling). Now you can make some pasta! Making pasta is pretty straightforward assuming you have a decent pasta roller. Work with a quarter of your dough at a time just to make it easier. Feed it through the pasta roller a few times on the widest setting and then start cranking it down until it gets to the second-to-smallest setting (normally 7). The key to making pasta that I’ve found is to really flour it up. It’s pretty hard to use too much flour because extra flour will just fall off. This is some pretty perfect looking pasta if you ask me. Assuming you have a long counter, you can just stretch the finished pasta sheet out in one long piece. I cut my pasta sheet in half though just to make it easier to work with. Again, use a lot of flour on the bottom of the sheet so it doesn’t stick as you make the Winter Squash Ravioli. Then just dollop out large teaspoon sized lumps of filling on the pasta sheet. 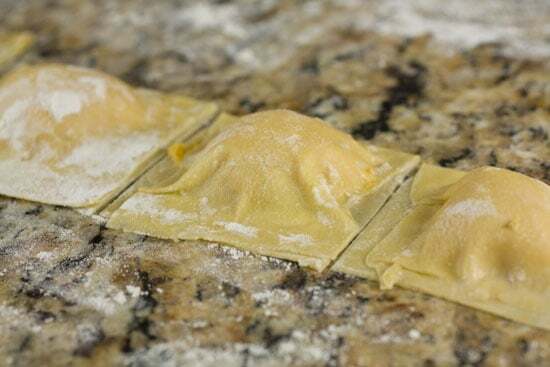 Make sure that you leave about an inch between the ravioli and also put the filling in the bottom third of the ravioli since we are going to fold them over. A good teaspoon will help. At this point, use a ravioli cutter to slice up the ravioli into individual pieces. It’s actually important to slice them before you seal them I’ve found because it lets you get a better seal on each ravioli. Then, work with one ravioli at a time. Dip your fingers in some water and wet around the filling. Then fold the pasta over and seal it up! Try to press out as much air from the filling as possible. Then take your ravioli cutter and run it around the edge of each ravioli. This will make the ravioli pretty, but will also make it really sealed well. This is an optional step, but I think it helps. The important part about making ravioli (I think) is to not freak out about them. Unless you’re working in a professional kitchen and people are paying $20 to eat 6 of your ravioli, they don’t need to be perfect. They won’t be perfect. As long as they are sealed though, they will cook fine and still be delicious. I graded myself on my first batch of ravioli. Even my “F” ravioli tasted delicious. By the way, it is important to toss them in flour as you finish them just to make sure they don’t stick. A quick interlude on the ravioli thing. I just wanted to show you guys this delicious spinach salad that we served before the ravioli. 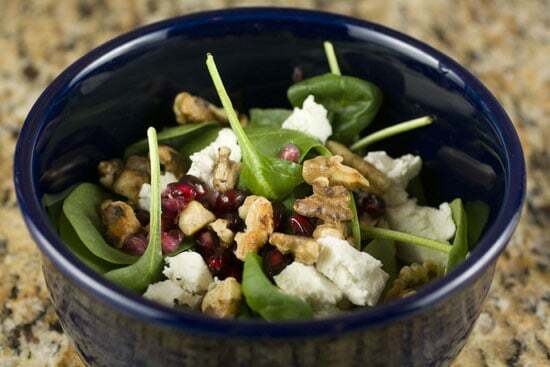 Super simple ingredients: spinach, goat cheese, pomegranate seeds, and toasted walnuts. I also whisked together a quick apple cider vinaigrette that we served with this that was just out of this world. 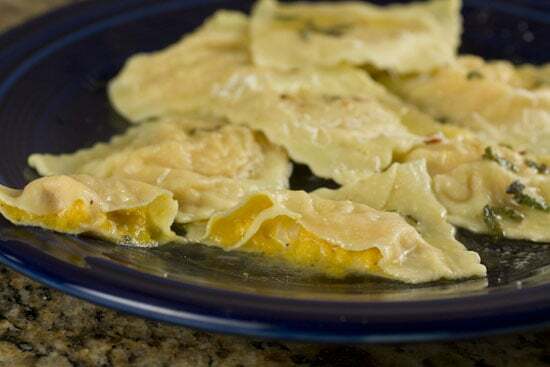 Once your Winter Squash Ravioli are made, you can either cook them now or freeze them for later. Even if you are cooking them now, I recommend freezing them for a few minutes just to firm them up a bit. When you are ready to cook the ravioli, just toss them in salted boiling water for about 3-4 minutes. When all the ravioli are floating, they are done. Meanwhile you can work on the sauce which is just a few ingredients: butter, sage, red pepper flakes. As the ravioli cook, melt the butter down over medium heat and swirl all these ingredients together. I like to add in a few spoonfuls of the pasta water also which thickens the sauce a bit. Drain the ravioli well, put a few on a plate, and drizzle the butter sauce over the top. This is about as good as it gets if you ask me. People are intimidated by ravioli and I get that. They seem complicated. You have to make the dough, fill each individual thing, seal them up, and worry about presentation. It’s a lot, but the key thing to remember is that they don’t have to be perfect. Once your guests try that first bite, they won’t care what they look like. The other nice thing about ravioli is that you can make them way in advance. In fact, when I made these Winter Squash Ravioli for our Christmas Eve feast, I made them the day before and just froze them until I needed them. Are you a homemade ravioli fan? Have you ever made it yourself? Leave a comment! I tried to make homemade ravioli once with my grandmother many years ago; I think the problem I have with making ravioli, and forgive me for saying this, is that it’s a ton of work for results that, quite frankly, weren’t really worth it — at least when I made them. Our homemade ravioli came out fine, but compared to frozen ravioli you can buy at the store, the quality certainly wasn’t so much so that it was worth all the effort. Amazingly awesome homemade / fresh fillings aside, the pasta itself was a pain and the results were lackluster. This post does make me want to try my hand at making them again, tho. We’ll see. These look incredible !!! You’re definitely right mark. They are a lot of work. LIke anything though, the more you do it the faster you get. I made this recipe twice in the same week (once to photograph and once for real). I noticed that I tried a huge amount of time off of the prep the second time around. I was a lot faster at all the steps. That said, it’s still a good amount of work. The good news is that they freeze really well and keep for awhile if you wanted to make a large batch of them. Frankly, I reserve homemade ravioli for special occasions. I actually did just try homemade ravioli for the first time! I wasn’t in love. My dough seemed a little to hard, but I think I’ll try your dough recipe next time. Looks fantastic! Yea… this is my standard dough recipe. It works great. Looking at yours, it looks like your dough is a bit thick for ravioli. I usually crank my down to almost the thinnest setting on the pasta roller. Trader Joe’s has some interesting types of fresh and frozen ravioli. And probably other sorts of non-mainstream grocery stores like maybe Whole Foods also. Ha! yea… it can be a labor of love for sure Morgan. The first few times I made homemade pasta I had the same results (sort of lackluster)… keep trying though and after a few tries you’ll be great at it. Good luck!